As part of the launch of the updated versions of WUFI® Plus and WUFI®Passive, the no-cost WUFI® Plus Free and WUFI® Passive Free packages and the WUFI® product website have been updated. The updated software and website offer new and enhanced content and features. WUFI® Plus 3.0 and WUFI® Passive 3.0 offer a number of new and improved features. Using monthly-balance-based energy assessments, the passive house module speeds up the design of energy-efficient buildings. The methodology for designing and certifying passive houses has been revised by Fraunhofer IBP´s U.S. partner PHIUS (Passive House Institute U.S.). The new passive house certification is now climate-specific. This climate-specific metric has been fully implemented in the new versions of WUFI® Plus and WUFI® Passive, and can now be used to certify passive houses in the American market. New, powerful simulation features now include dynamic, three-dimensional calculation of thermal bridges and a building air flow model. The air flow model can also be used to simulate a blower door test. Furthermore, simulation of building systems can be visualized. Another new module allows users to assess possible overheating in summer during the design stage, thus avoiding problems that cannot be corrected later. With its user-friendly interface, a wide range of databases and interfaces, and an extensive choice of output formats for the results, WUFI software continues to help users manage projects effectively. The extended program functions are specifically aimed at planners, energy advisors, manufacturers of building materials and to anyone dealing with the wide-ranging issues surrounding both residential and non-residential new building and renovation projects. Beyond these standard areas of application, the WUFI® programs are also employed in projects dealing with buildings far removed from standard usage, including historic buildings, cold storage units, and swimming pools. You can upgrade your current WUFI®-Version in the Webshop. Information on upgrade pricing is provided in the Webshop. 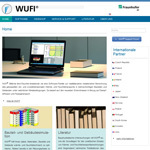 The new and improved WUFI® product website provides extensive information on all the WUFI® software applications. It also offers helpful examples of how the programs can be used and includes links to manuals, demonstration videos, and sample projects. Those looking for more information will find a wide array of specialist publications. The website is currently available in German and English; Chinese and other language versions will follow soon. Thanks to the Institute’s close collaboration with world-wide partners, users will find plenty of additional information in their own language.